Are the Austin bombings terrorism? Four bombs have now gone off in Austin, Tx, over the last 17 days. The most recent was last night, a bomb triggered by a tripwire that left two men injured. According to the FBI, this “changes things,” representing a significant step up in the sophistication of the device compared to the earlier bombs which left two African-American men dead and a hispanic woman critically injured. All four devices share similarities which suggest they are the work of the same bomb maker. The first three bombs were all left at residences, disguised as delivered packages. All detonated as the victims were opening or handling them. The fourth bomb was left on a roadside in a different area of the city. Because the first two victims were black, a 39-year-old construction worker and a 17-year-old high school student, both related to prominent members of Austin’s African-American community, the attacks have raised suspicion that they are racially motivated. The area where the first three bombs went off were neighborhoods east of I-35, the six-lane highway which divides the affluent and predominantly white west side of the city from where black and hispanic residents have historically lived on the east side. The fourth bomb, however, breaks from that pattern. It was planted in the city’s southwest. The two men injured in the blast are both white. So where does that leave us? Can we describe these as acts of terrorism? Four bombs have now gone off, all apparently the work of the same individual or group of individuals. The attacks have left the city on edge, with police urging the public to be alert for suspicious packages. The neighborhood where the fourth bomb went off was placed on lockdown until this afternoon, with residents kept in their homes and school buses ordered to stay away. The identities of the first three victims suggest a possible motivation. That last is the key to understanding whether or not what is happening in Austin constitutes terrorism or something else. Definitions of terrorism typically focus on several key elements: threat or use of violence; intention to create fear in an audience beyond the immediate victims of an attack; all in the service or pursuit of some political/social/religious motivation or objective. So that’s what we still need to know about the Austin attacks. Until we find some further evidence of common ideological motivation connecting the bombings, we will have to reserve judgment. While the world’s attention has been riveted on the rise and now near demise of the Islamic State, al-Qaeda has quietly rebuilt, solidifying its influence in Syria, Yemen, and Somalia, returning to Afghanistan, and adding new affiliates in places like Kashmir. So argues veteran terrorism scholar Bruce Hoffman in a report published last week by the Council on Foreign Relations. 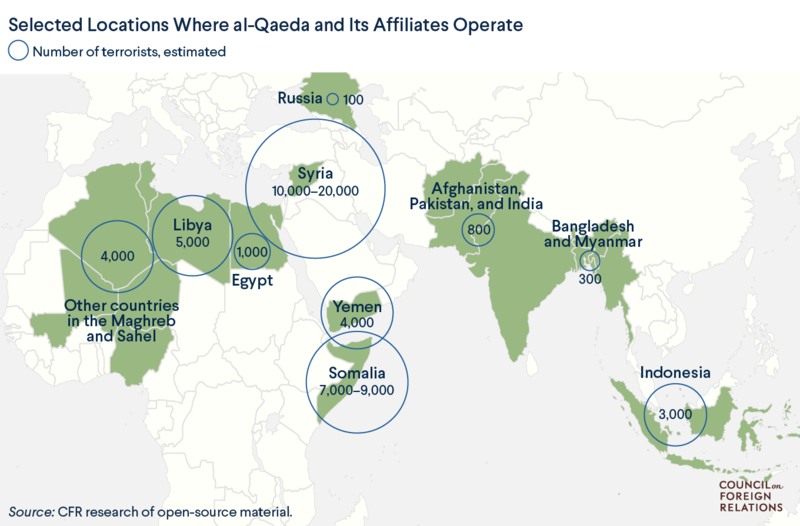 Forces loyal to al-Qaeda and its affiliates now number in the tens of thousands, with a capacity to disrupt local and regional stability, as well as launch attacks against their declared enemies in the Middle East, Africa, South Asia, Southeast Asia, Europe, and Russia. Indeed, from northwestern Africa to southeastern Asia, al-Qaeda has knit together a global movement of more than two dozen franchises. In Syria alone, al-Qaeda now has upwards of twenty thousand men under arms, and it has perhaps another four thousand in Yemen and about seven thousand in Somalia. According to Hoffman’s report, this resurrection comes despite the killing of many of AQ’s top leadership, including Osama bin Laden at the hands of US forces in 2011. A key moment, he argues, comes in 2012-13 when thousands of AQ veterans were freed from Egyptian prisons during the tumultuous Arab Spring period in that country. The AQ franchise in Syria, Jabhatat al-Nusra, now know as Hayat Tahrir al-Sham, has emerged as the largest rebel group still standing, having helped eliminate most of its both secular and Islamist rivals. While ISIS has been eclipsed in Syria and elsewhere, it still commands more attention from counterterrorism experts and policymakers due to the belief that it remains capable of carrying off spectacular attacks in Europe and elsewhere. Al-Qaeda, seemingly, does not represent such a threat. Hoffman, however, argues that the supposed inability of a revived al-Qaeda to launch attacks against targets outside of its areas of current operation is a matter of strategic choice, not lack of capability. [This] … is a product of [AQ leader Ayman] Zawahiri’s strategic decision to prohibit external operations in the West so that al-Qaeda’s rebuilding can continue without interference. The handful of exceptions to this policy—such as the 2015 Charlie Hebdo attacks in Paris and the 2017 St. Petersburg Metro bombing in Russia—provide compelling evidence that al-Qaeda’s external operations capabilities can easily be reanimated. Yemen-based al-Qaeda in the Arabian Peninsula’s capacity to commit acts of international terrorism—especially the targeting of commercial aviation—was recently the subject of a revealing New York Times story. Hoffman finally argues that the success of AQ’s rebuilding efforts are the result of a series of key decisions made by Zawahiri — to strengthen its “franchising” model of organization; to avoid mass-casualty operations, especially those which might kill Muslims civilians, as a way to rebuild popular support; and third, to let ISIS take the heat from the West. As Hoffman’s report makes clear, we ignore AQ to our peril. You should give it a read. Now on to this week’s look back at terrorism history. March 11, 2004 — Madrid: The Abu Hafs al-Masri Brigades claimed responsibility for the detonation of four bombs on Madrid mass transit trains, killing 198 and wounding more than 600. The group claimed an affiliation with al Qaeda, however, in the years since the attack, scholars and analysts have raised doubts about the both the group’s ties to al Qaeda and its responsibility for the 2004 bombing. March 12, 1999 — Colombia: FARC leader Vladimir Gonzales Obregon is killed by the Colombian army. March 13, 1999 — Turkey: A bombing at a shopping center kills three and wounds six. The Revenge Falcons of App, a Kurdish ethnic-nationalist group, claims responsibility. March 14, 2004 — Ashdod, Israel: Two near-simultaneous suicide bombings kill 10 and wound 18. Both Hamas and the al-Aqsa Martyrs Brigade claim responsibility. March 15, 2001 — Saudi Arabia: Chechen hijackers seize control of a Russian airliner en route from Turkey to Moscow, forcing it to land in Saudi Arabia. Three people were killed, including two believed to be passengers, when Saudi security forces stormed the plane in a rescue operation. March 16, 1984 — Beirut, Lebanon: William Buckley, the CIA station chief in Beirut, is kidnapped by Hezbollah. He dies in captivity three months later. Buckley’s remains were recovered in 1991. March 17, 1992 — Buenas Aires, Venezuela — A car bomb destroys the Israeli embassy, killing 28 and wounding 220. Hezbollah claims responsibility. Editor’s note — Your humble blogger got a little behind the last few weeks, and so it’s been a bit since I posted one of these looks back. I don’t expect many of you missed it, but just in case you did, apologies. Much of the anxiety that fuels current fears about terrorism and propels US counterterrorism national security policy today has its origins in policy decisions and failures that stretch back almost 40 years now. I have been reminded of that thanks to two different things I’m spending time with, Steve Coll’s book Ghost Wars, on US foreign policy in Afghanistan from the Soviet invasion in 1980 to 9/11, and the Hulu adaptation of Lawrence Wright’s The Looming Tower on the origins of the 9/11 attack and the mistakes and policy failures that allowed it to succeed. Both offer a sobering reminder that when it comes to terrorism much of our current difficulties are of our own making. Coll reminds us that the training camps, stockpiles of weapons, ammunition, and explosives, and safe havens that were created as a flood of CIA money swelled the coffers of Afghan mujaheddin waging jihad against the Russians would later constitute the “terrorist infrastructure” facilitating attacks on the United States and its interests. Coll’s book and the Hulu miniseries remind us that the institutional jealousies, rivalries, and dysfunctions that prevented the CIA and FBI from working together to prevent the 9/11 attack were present from the outset as the US government stumbled its way to developing a coherent response to international terrorism. Both Coll’s book and the Hulu series are highly recommended. Now for this week’s look back. March 4, 1999 — Batman, Turkey: Three people are killed in a suicide bombing. The Kurdish Workers Party (PKK) is suspected. March 5, 1998 — Sri Lanka: The Tamil Tigers (LTTE) are blamed for a bus bomb that kills 37 and wounds more than 250. March 6, 1999 — Venezuela: The bodies of three American peace activists are found. The Revolutionary Armed Forces of Colombia (FARC) are blamed for their deaths. March 7, 1973 — New York City: Vehicle bombs are discovered and defused at the El Al terminal at Kennedy International Airport, the First Israel Bank and Trust Co., and the Israel Discount Bank. Nearly 20 years later, in 1991, a member of the Palestinian group Black September is arrested and convicted in connection with the thwarted bombings. March 8, 1978 — Portadown, Northern Ireland: Members of the Red Hand Commando, a loyalist paramilitary group with links to the Ulster Volunteer Force, kill two Catholics, one a civilian and the other a member of the Irish National Liberation Army. March 9, 2000 — Houston: Federal agents arrest Mark Wayne McCool, the one-time leader of the Texas Militia and Combined Action Program on charges of conspiring to attack the federal building there. March 10, 2011 — Alaska: Six members of the antigovernment Alaska Peacemakers Militia, including its leader, are arrested and charged with plotting to kill or kidnap state troopers and a Fairbanks judge. The group’s cache of weapons included a .50-caliber machine gun, grenades, and a grenade launcher. 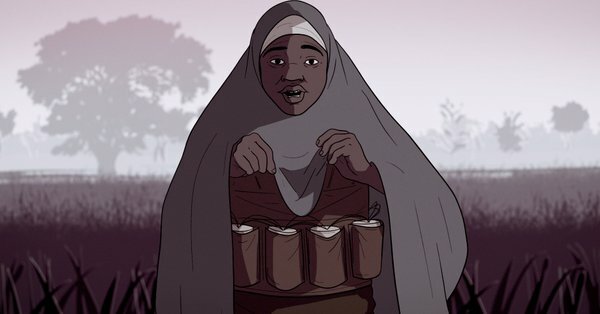 The BBC has created a visually stunning and heartbreaking report on the phenomenon of female suicide bombers in Nigeria, many of whom were abducted by Boko Haram or other militant groups. The report, illustrated in the style of graphic novel, leverages the narrative of a young Boko Haram abductee to describe the strategy and highlight the dynamics that have led Boko Haram to adopt the use of this weapon in its struggle against the Nigerian state. It is based, in part, on the work of terrorism researcher Elizabeth Pearson, who has studied the use of female suicide bombers by Boko Haram. Sanaa Mehaydali is thought to have been the first female suicide bomber in modern history. The 16-year-old killed herself and two Israeli soldiers in a suicide attack in southern Lebanon in 1985. Since then, militant groups such as Hezbollah, the Kurdish PKK, Tamil Tigers in Sri Lanka, Hamas and Black Widows in Chechnya, have all used women and girls to carry out suicide attacks. But Boko Haram has outstripped any one group by far in the scale of its brutality, according to Elizabeth Pearson, associate fellow at the Royal United Service Institute in London. She estimates that hundreds of young girls have been forced to carry out attacks in the past three years, in Nigeria, Cameroon, Chad and Niger. In the report Pearson notes that the organization gained far more publicity from using young girls as suicide bombers compared to earlier operations carried out by boys or men. This, in part, has encouraged Boko Haram’s continued use of girls. Now on to this week’s look back. Feb. 12, 1974 — Latimer, Buckinghamshire, England: The Irish Republican Army detonates a bomb at the National Defense College, wounding 10. Feb. 13, 2003 — Pennsylvania: Federal agents arrest David Wayne Hull, imperial wizard of the White Knights of the Ku Klux Klan and an adherent to Christian Identity theology, alleging that he had arranged to buy hand grenades in order to attack abortion clinics. Feb. 14, 2011 — Bahrain: The 14 February Youth Coalition forms, growing out of ongoing political unrest. It is later suspected of involvement in a series of firebomb and attacks against Western interests. Feb, 15, 1999 — Turkey: Abdullah Ocalan, the fugitive leader of the Kurdish Workers’ Party (PKK) is arrested in Kenya with the assistance of U.S. intelligence and returned to Turkey. Feb. 16, 2013 — Hazara, Pakistan: A bomb kills 84 and injures more than 190 near Quetta. Lashkar-e-Jhangvi, a Sunni supremacist organization which has carried out sectarian attacks against Shiite Muslims, claims responsibility. Feb. 17, 2012 — Washington, D.C.: Amine El Khalife is arrested in an undercover FBI operation, accused of planning to cary out a suicide bombing at the Capitol building. The Moroccan citizen was in the country illegally, having entered the U.S. on a visitor’s visa at the age of 16 and then staying after his visa expired. Feb. 18, 2010 — Austin, Texas: Joseph Andrew Stack, who had been associated with radical anti-tax groups, flies his single-engine airplane into a building housing offices of the IRS. Stack and an IRS manager are killed and 13 are injured in the attack. Prior to the attack Stack had posted online a lengthy manifesto criticizing the IRS, the tax code, politicians, and corporations.